As a child gazing into the dreamy landscapes painted by a favorite aunt, I decided early on that I wanted to explore painting in oils! Although raising a family and a career slowed this goal down a bit, I continued to pursue lifelong dreams and began to paint. I have been painting with oils for over thirty years now. A career brought me to what became my second love… the Central Coast of California! I planted roots, worked hard, painted when time permitted and raised a family. 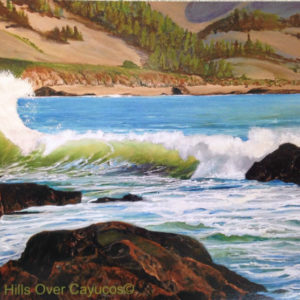 I have been a resident of the Central Coast for over 25 years and paint whenever there is a spare moment! I love to paint with lots of fine layers (glazing) to give each piece that translucent effect. There are endless skies, sea and hillsides to fill the heart of an artist. My hopes and dreams are that each work of art I produce goes to a happy and loving home, because it feels a tiny bit of my soul goes with it.